As of about a week ago winter decided to show up. The temps have been in the twenties and we’ve received lots and lots of snow (which I’m not complaining about because it’s so beautiful). We live right by the mountains and it’s stunning to look out my windows every morning and see the snowcapped mountains in the distance, it’s so majestic looking! I used to hate the winter when I was little but the older I get the more I love it and appreciate the beauty of it. Most days we stay cozied up inside in our pajamas, especially since Jackson is still so little but my favorite down coat to wear when I do go out is my Bernado coat. I wore it on my IG last week and got so many compliments on it!! I love it because it keeps me so warm but it’s also cute (form and function!!!). And how beautiful is the color?! Right now it’s on sale for $100 so it could be a great gift option to give to someone on your list (or to yourself ;). Great outfit! Loving the red winter coat. It really stands out and looks super warm and comfy. Love the grey sweater… you look so bundled up and cozy indeed! Love the color on that jacket! So cozy! Thank you, Sharan :) I love reading your comments! I love this outfit! It doesn’t snow where I am, but when I go to visit I can never find cute winter clothes. I love that coat! It was the same with me when I was younger, hated the cold and being forced outside. But now that I’m older, winter is really beautiful! Love this coat..must be so warm!!! I love the winter, too! Growing up in Idaho, you kind of had to. Your dark hair against that coat and snow is stunning. I love Bernardo coats. You look so cozy and warm, love that coat! I love the color of your coat!! So perfect for a snowy winter day! Love that shade of red on you! Did your post cause this jacket to sell out, or did you buy it a while ago? The only similar one online is $188. I love the color & need a packable one for a trip. Hi Rachel, I love all your photos on your blog and instagram! Absolutely love your style and the pics of your family and your home are so lovely! I am visiting the Salt Lake City, Provo and Park City area with my family for the first time and we will be spending just a few days there the first week of January to celebrate my parents’ wedding anniversary. Do you have any suggestions and top picks on best restaurants, and what to see and do there, and as first time visitors? Thanks so much! 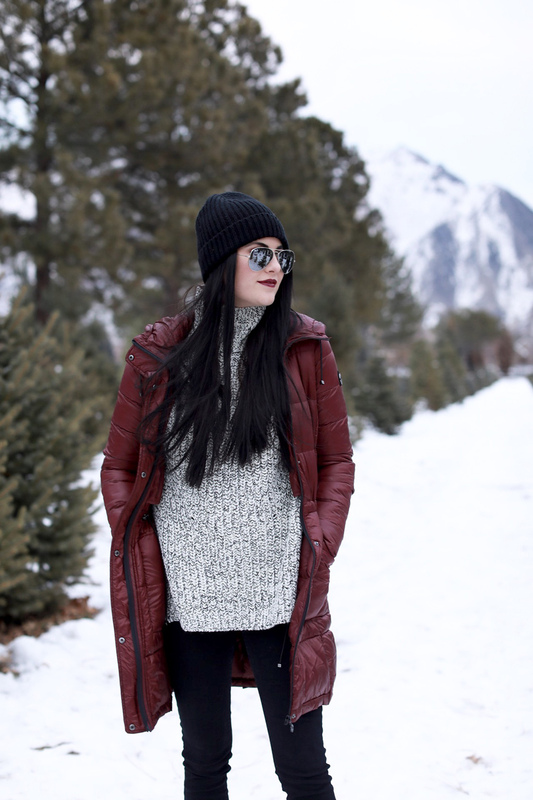 I LOVE this bundled look for a trip up the canyon! I really love your style! It’s so simple yet intricate. ? Love the comfort and the chic of this look. I’m always looking for comfort on my outfits and this is def one of them!